YOUNG RESEARCHERS. 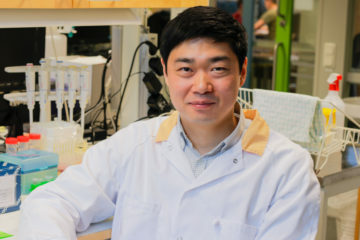 As a physician in clinical microbiology with research time in the Wallenberg Centre for Molecular and Translational Medicine (WCMTM), Ka-Wei Tang is investigating a potential Achilles heel of the Epstein-Barr virus. If the hypothesis holds true, the research may eventually lead to a new cancer treatment. It’s clear that the translational concept, in which basic scientific methods provide answers to clinical questions and hopefully are quickly converted to new treatments, is something that really appeals to Ka-Wei Tang, whose research deals with how viruses can cause cancer. He works primarily with a research hypothesis that could lead to a new strategy for treating cancer that is linked to the common Epstein-Barr virus. Ka-Wei Tang has his office in the Sahlgrenska Cancer Center. Here chatting with Fredrik Bergh Thorén, a colleague in his corridor. He’s a physician, who was trained in Gothenburg and also received his doctorate here in 2016 with a basic science dissertation on the herpes virus DNA replication. At the end of his doctoral studies, he bumped into bioinformatician Erik Larsson Lekholm. Erik had just come back from his postdoc at Memorial Sloan-Kettering Cancer Center in New York. The study encompassed analyses of 700 billion RNA sequences from more than 4,000 tumors and resulted in a massive map of viruses presence in 19 different types of cancer. Results of the study, which were published in the journal Nature Communications, were able to confirm the links between viruses and cancers that are already known, such as the fact that liver cancer is often caused by hepatitis viruses and that the human papillomavirus causes cervical cancer and some types of head and neck cancer. But what was most interesting was the study’s non-discovery. 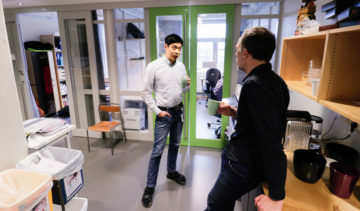 Ka-Wei is establishing a team at Sahlgrenska Cancer Center, where he shares a small office with three other colleagues. One of them is his doctoral student, who began a month ago. “There are probably both pros and cons of sitting so close to a supervisor as she does, but we’re only sitting here some of the time,” says Ka-Wei, who smiles at the memory of the daily contact he had with his supervisor during his doctoral studies at Medicinareberget. His current research track deals with the Epstein-Barr virus, which is part of the herpesvirus family and is transmitted via saliva and kissing. Almost every adult on Earth carries the virus latently without displaying any symptoms. The virus can cause several different diseases, and in rare cases even stomach cancer and lymphoma, a type of blood cancer. The risk that the virus will cause lymphoma increases if you are being treated with immunosuppressive drugs after an organ transplant or if your immune response is reduced for other reasons. “There is currently no targeted treatment against the Epstein-Barr virus, but we are working on a hypothesis that we hope can lead to a treatment,” says Ka-Wei. The Epstein-Barr virus was the first tumor viruses to be detected. Researchers have long tried to inhibit the proteins that the virus genes code for, but no one has succeeded yet. In recent years researchers have understood that genes of the genome that do not give rise to proteins also are of great importance during the development of cancer. “Non-coding RNA can affect other genes even if it doesn’t encode a protein. We have shown that a viral non-coding RNA is a potential Achilles heel. When we knock out this gene, cells cannot divide anymore,” says Ka-Wei. In the clinical part of his position, he’s involved with clinical microbiology, where he interprets patients’ lab results. 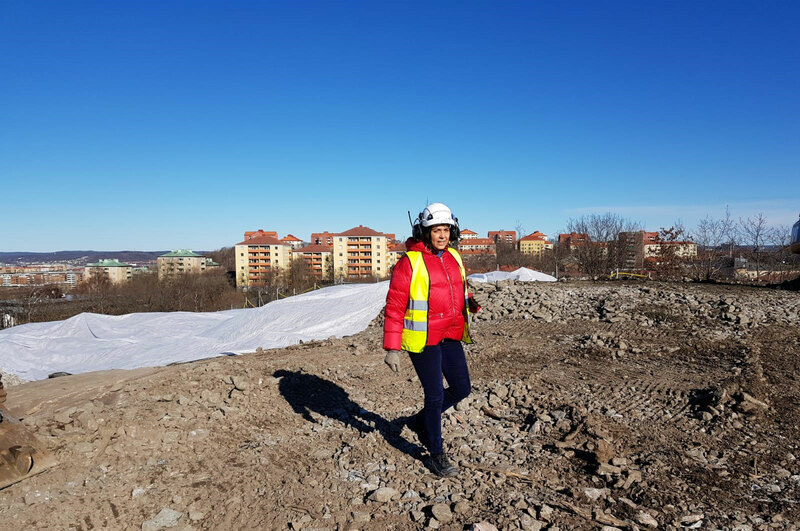 At Sahlgrenska University Hospital, he also runs a development project that provides a whole new perspective when it comes to sample analysis for patients. Last winter, when he learned that he had received funding through the Wallenberg Centre for Molecular and Translational Medicine, he was on the verge of leaving for a postdoc position. “I had been accepted at Stanford, where I would have been working in a team investigating how cancer drugs can be used against serious viral infections, such as Ebola. Their translational approach, where they start out with cell culturing and implement treatments out in the field, is an extremely appealing concept, and I really looked forward to starting with the team,” says Ka-Wei, who did not hesitate before deciding to accept the offer of the position through WCMTM. “It was a fantastic opportunity that you only get once in a lifetime and that I couldn’t turn down. I’m surrounded by passionate researchers, and together we will find common points that can lead to new and exciting translational research,” he says, smiling.